We see in 41:46 that Joseph is 30 when he is elevated to 2nd in command of Egypt. He was sold into slavery at the age of 17. What character qualities have been shown and developed over these 13 years? 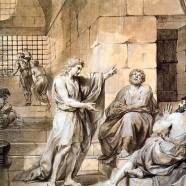 (humility – he always gave God the credit for whatever he did; patience – he has learned to wait on the Lord, even when treated unfairly; diligence and dependability – the work at Potiphar’s and in prison taught him to be responsible and to work hard) Joseph probably wondered why God had allowed all of the trials into his life, yet he did not despair or give up. He continued to do what was right and trust in God. If he had been rescued at any other point before the day that Pharaoh had his dreams, Joseph would not have been at the right place at the right time so he could fulfill the job that God had for him – the preservation of his people, Israel. What do you think God is trying to teach you right now? What steps of obedience do you need to take to be pleasing to God and learn from the trial you are up against? Write two journal entries from the viewpoint of Joseph. The first one is to be on the first night of his imprisonment after Potiphar’s wife denounced him (Gen 39). The next is to be the night after he was put in charge of all Egypt (Gen 41). Write his emotions and perspective at these two times in his life. Be sure to include his relationship with the Lord and how he views God’s purposes. What character qualities need to be developed in you? Write how you think the trials you are facing can help develop these in your life. Name at least three qualities and give Bible verses for each. Give specific steps as to how you are working on becoming more mature and more pleasing to the Lord.